Important warning : for an efficient fitting of a 2D spectrum, restrict the sizes in both dimensions to a minimum value (see example spectrum for examples). call the Spectrum Parameter Dialog [Menu/File/Show Parameters] or click the "Spec Param" buttion on the left pannel. In the "F2 param" tab select the nucleus of the MQ experiment "27Al" for example. Click the "Calibrate MQ..." button which should show this window. The shear factor is computed for a 3Q experiment and the shift (as used in Bruker shearing routine) should show in the shift F1 place. If not correct, adjust values. The nFold value allows you to scroll the F1 dimension. Click the Ok button to process. Once calibrated you can show the diagonal (slope 1 in ppm) by going to [Menu/2D/DiagSlope] and setting the slope to 1 (if not already done) The spectrum should show as presented below. A good practice is now to save the calibrated spectrum : [Menu/File/SaveAs] "mycalibratedspectrum.rr"... Do nor forget the ".rr" extension. Load the 2D calibrated spectrum "mycalibratedspectrum.rr" that we just saved, go to [Menu/2D/Diagonal] and set a slope of 1 to obtain the 1/1 ppm diagonal. Remove from the fit parameters dialog [Menu/Decomposition/Fit Parameters] or all lines corresponding to the outer transition only keeping the lines of the central <1/2> transition "CzSimple" model (if you take my example file, also remove the smallest AlO6 component which dos not show up in the MQMAS spectrum). Expand the window to show the "Fit 1D" selection box at the bottom of the left pannel and change it to "MQMAS"
Click the "Compute Button"  to obtain the starting Model. This computation takes quite a while !!! + Because we now have an F1 axis we need to put a width in this dimension. 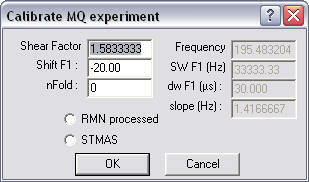 This width has to be big enough to obtain a smooth model but not so big as to mask the expression of the NMR parameters. This "Width" is given in Hertz and should not be optimized. + As in the case of the 1D fit the EM serves to obtain a smoothed representation of the lineshapes and the distribution of isotropic CS is obtained with the "FWHM CS" value. + As in the case of the 1D fit the d parameter is better fixed to 5 to have a Gaussian Isotropic Model distribution. + Now the computation is long, this is normal as it has to compute for every point in the 2D spectrum.... Reducing the presentation widow results in quicker computation and optimisation !!! + As in the case of 1D fit with CZSimple, a proper integration is obtained in the [Report] dialog by numerical integration... Be patient this is a very time consuming operation.